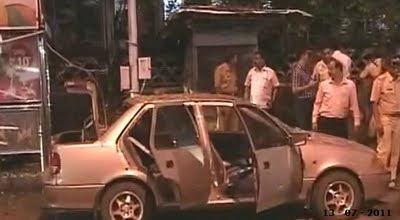 The three blasts in Mumbai on 13th July 2011 not only killed nearly 20 innocent people but shook the city yet again. The previous attack on Mumbai 26/11 2008 was horrific enough to have killed over 200 people. The tragedy was followed by the great resilience of Mumbai citizens to rehabilitate the victims to line up for blood donations and help in many more ways, the efforts which make us salute Mumbai citizens yet again. The tragedy of blasts has activated investigations, the sharp tongues and the writers to investigate and hypothesize the ‘who done it’ of the blast. And as is their wont the politicians of different hues also saw this as an occasion to put forward their theories of causes of terror and the remedies. One stream indicated that it is the act of Jihadi terrorists, Pakistan, ISI, the usual suspects in any act of terror. Added with the analysis that since India is not hard enough, the terror attacks are continuing. While US after one attack adopted policies due to which no more terror attacks take place there. The usual suggestion of attacking Pakistan to avenge this act of terror, this time did not surface so much as in 2008 when Baba Ramdev had promised to fund the war against Pakistan to avenge the terror attack. Most hilarious was the statement of Raj Thackeray, the one asserting that Maharashtra is only for Marathi people, who went on to say that the terror attacks are taking place as more and more immigrants are coming to Maharashtra from other states! Digvijay Singh, who has been consistently pointing out that the terror attacks have been taking place due to the likes of Sadhvi Pragya Singh Thakur and Swami Aseemanand also, cautioned that while trying to look at Muslim culprits those associated with RSS ideology should also be given a look at. Meanwhile as the act of investigating terror is fairly difficult, the investigating authorities do begin their work on some suppositions and the easiest one to follow for them so far has been to work on the lines that, ‘All Terrorists are Muslims’. In accordance, the names of Indian Mujahedeen and SIMI are already in the air, the theory of scooter being used for the blast is there and one hopes this lead will be given due importance. The immediate thought of Indian Mujahedeen, a supposed offshoot of Lashkar-e-Tayyaba, Al Qaeda type outfit is always amongst the most initial ones’. This trend was present all through even when the blasts were taking place in front of Mosques at the most crowded times. The whole creation of AL Qaeda and the US media coining the term Islamic terrorism has been a deliberate ploy on the part of United State in pursuit of the control over oil resources. Al Qaeda itself was in a way product of the US policies. The Russian army’s occupation of Afghanistan on invitation from the local Communist group came in handy for US to undertake its policy to make its presence stronger in the oil zone. US has been working on the theory that ‘Oil is too precious to be left to the Arabs and others of the region’. While pursuing this policy US not only planted Israel in the region, it made pacts with the tyrannical local rulers like those of Saudi Arabia but also went in to promote the radical Islamist groups. In the face of Russian Army’s occupation of Afghanistan, it undertook this more actively. A syllabus was designed to brain wash the Muslim you in Madrassas, especially set up in Pakistan. In this syllabus the word Jihad was presented as killing non Muslims. The meaning of word Jihad in Koran is to strive to the utmost. In Koran this word appears 41 times and none of the times it is equivalent to war. Similarly the word Kafir, for those who hide the truth was distorted and the Muslim youth were indoctrinated to kill and maim the Russian army. Osama was given the leadership of this group and was supplied with 8000 million dollars and 7000 tons of armaments, with the help of which Al Qaeda joined anti Russian forces and succeeded in defeating the Russian forces. Later the offshoots of these groups extended their operations to Kashmir, other parts of India, Mumbai in particular. Its major area of operation remains Pakistan itself where it has been wrecking havoc through different acts of terror, one of which was the killing of Benazir Bhutto. In Pakistan there are multiple forces. The terrorist groups are close to Army and thereby to ISI. While the civilian government of Pakistan is for control on these groups, the army is promoting them. Every time India and Pakistan try to make initiative for dialogue and peace in the region, these groups are activated to see that the dialogue process is halted. One of the suspicions of the blast can be on those groups who are against the India Pakistan Peace. One recalls such an efforts was there before November 26, 2008 attack. Even now the dialogue process is beginning so those groups opposed to India-Pakistan friendship may have undertaken this heinous act. It is a matter of relief that Indian Government is committing itself to the peace with Pakistan, despite the provocation and noise from the hawks like Advani and Co. There are many acts of terror which came to surface, especially from 6th April 2006, when a blast killed two Bajrang Dal, an RSS affiliate; workers while making bomb. During this period many such bomb explosions took place in various places in Maharashtra, Jalna, Parbhani, Aurangabad, Panvel etc. Most of these blasts took place in front of the mosques at the time when people were leaving the Masjid or other places of congregation. In this line the bomb blasts of Mecca Masjid, Hyderabad, Malegaon, Ajmer and others were very prominent. Despite solid evidence, the police departments were pursuing the leads in a passive fashion, till Hemant Karkare took over as the Chief of Maharashtra Anti Terrorism Squad. With meticulous investigation he found the connection of motor cycle used in Maelgaon blast to Sadhvi Pragya Singh Thakur, This lead unearthed the whole gang involved in these acts of terror, Swami Dayanand Pandey, Lt Col Prasad Shrikant Purohit, Retd. Major Upadhyay, Swami Aseemanand and others. Meanwhile the murder of RSS worker Sunil Joshi and the connections of RSS functionary, Indresh Kumar spilled more beans for the investigation. The role of two organizations, Abhinav Bharat and Sanatan Sanstha, both working for the goal of Hindu Rashtra, also came to the surface and National investigation Team is following the case at the moment. The biggest back up information came from Swami Aseemanand of VHP, a major associate of RSS. Swami Aseemanand in a confession in front of the magistrate told the whole story behind these terror blasts, leading P.Chidmabaram to use to word ‘Saffron terror’ for the whole phenomenon. The question marks raised by many people about Hemant Karkare’s death angered those close to RSS ideology. Just to recall as Karkare was investigating these acts of terror, Gujarat Chief Minister Narendra Modi called him Deshdrohi (anti-National) and Shiv Sena’s mouthpiece Saamna wrote that ‘we spit on his face’. No wonder the same Hemant Karkare was killed on the attack on Mumbai on 26/11 and various versions put forward by police raised the questions about the death of the police officer. It is in this context that the then minority affairs minister A.R. Antulay said that there is terrorism plus something else in the Mumbai attack of 26/11. Those close to the ideology of these terror groups condemned Antulay to no end. Related to this was the killing of two Muslim youth in Delhi, Batla House. The death was in mysterious circumstances and it was presented that these were two terrorists who have been killed in the police encounter. The question marks on the authenticity of police version have been put by civic human rights groups and Congress Secretary Digvijay Singh. In the same context the city of Azamgarh was projected to be the terror den and many innocent Muslim youth had to leave their education half way for the fear of being apprehended by police and so they returned to their homes. Even one of the lines of investigation for police is the Azamgarh connection. Very interestingly when all these acts of terror were going on many an innocent Muslim youth were put behind the bar, and their careers were ruined and atmosphere of fear started prevailing in Muslim localities. Mumbai has been a victim of acts of terror from last several years. To be more precise, the first major one occurred on March 12 1993, in which 13 blasts took place across the city killing 257 people. These were the blasts which took place in the aftermath of Post Babri Demolition Mumbai carnage. Later Mumbai also witnessed the acts of terror on December 2, 2002 when an explosion took place in a bus in Ghatkopar suburb of Mumbai killing two people. The backdrop to this was the massive anti Muslim pogrom in the wake of Godhra train burning. Similar tragedy shook the city on March 13, 2003, then July 29 2003, August 25, 2003 and the last one on July 11, 2006 in the First class compartment of Western Railway Local trains. The one on November 26, 2008 was of a different nature. It was an operation planned meticulously by a group of jeans tee shirt wearing terrorists numbering nearly ten. It seems they high-jacked a Gujarat registered fishing vessel on the high seas, sailed near Sassoon docks and reached Gateway of India in dinghies. They were carrying heavy backpacks; and divided themselves into 5 teams and unleashed mayhem mainly at CST, G.T. Hospital, Metro Cinema, Hotel Taj, Hotel Trident and Nariman House. The blasts took place at these places and also at Colaba market, Cama Hospital, Nehru Road (Vile Parle), NB Road (Malad) and at Free Press Road. The attack literally took the breath of Mumbai away for a while, the scale audacity, flamboyance and planning of this assault was astounding. It seems a lot of preparation had gone in to plan this attack, Mumbai attackers had clearly been trained well; the conspiracy had been in the making for close to a year. This was the time when India and Pakistan were trying to talk peace. After the current attack lot of ideas based on misconceptions are floating around. One such goes as saying that since Indian has not hanged Ajmal Kasab, these attacks are repeating. While saying this, one forgets that there are two mechanisms of someone taking to the path of terror. One is when a person or group feels that gross injustice has been done to them and this injustice crosses the threshold, the way it happened after the violence of Mumbai 92-93 or Gujarat carnage of 2002. Second is when due to political and economic goals the groups are set up and youth are brainwashed-indoctrinated to go on the path of terror for the sake of God (Al Qaeda types) or religion (Sadhvi Pragya Thankur or Aseemanand). In both the cases these indoctrinated person is motivated by the goals which are beyond life and death, willing to lay down their lives. So death or any other penalty is no deterrent for them. The terror groups have the ideology which exhorts the youth in the name of God or religion, mixed with great amount of faith. So the point is how one can go to the root of the issue rather than just punishing the culprits, which is easy enough. In addition in case of Kasab, the legal process of punishing him is on any way. The argument that United States had saved itself by future terror attacks due to its policies is appealing enough on first impression. When we go deeper we realize many a things. Some of these are contentious, the one like who did 9/11, there are enough websites and books doubting the version popularized by US media. Whatever is the truth of that, one thing is sure that US and prior to that the colonial powers have been the major culprits of violence in the World. In order to usurp the wealth of the World they do undertake policies whereby the trouble spots are located far away from their own lands. In case of promoting the groups like Al Qaeda, it is clear that because of the proximity of South Asia to the oil zone where US wanted to create its hegemony, spill over of terror attacks in South Asia is easy enough. That’s how the major victims of Al Qaeda type groups are not only India but also Pakistan, where these terror groups are playing the role of Frankensteins monster. Terrorism is a phenomenon which is an anti thesis of peace and amity. It has nothing to do with religion’s moral values. It derives its cover from the religion’s identity. A distorted version of terms from religion’s history is misused to indoctrinate the youth. Similarly a sense of injustice is instilled to incite the youth to take revenge by killing the innocents. When Ajaml Kasab sprays the bullets, those killed in the act are Hindus and Muslims both. When Swami Aseemanand talks of ‘Bomb for Bomb’ or such groups spread hatred for the goal of Hindu Rashtra, what is being talked is not the values of Vasudhaiva Kutumbka (whole planet is my family) or Ahimsa Parmodharam (Non-violence is the highest religion), what is being aimed at is the nation based on religions identity, a concept which people of India rejected lock stock and barrel during the freedom Movement.